As the CEO for Devenney Group, Julie brings over twenty years of experience as a critical care nurse and hospital executive to the team. Julie has served in the capacity of Chief Operating Officer, Chief Nursing Officer and Clinical Service Line Director. Her work has taken her from major quaternary urban academic medical centers to small community hospitals in both the for-profit and not for profit sector. 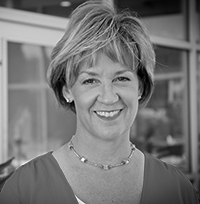 In addition to her role as the CEO, Julie serves as an in house clinical consultant to all members of the Devenney team in matters of healthcare technology, trends and process innovations. She provides clinical leadership for the project design and construction process to ensure that planning, design, construction and activation reflects the specific needs of clinical practice and efficient/effective operations. Julie is well versed in LEAN processes, patient , staff and materials flow, performance improvement, expense reduction, staffing management, and customer service excellence.